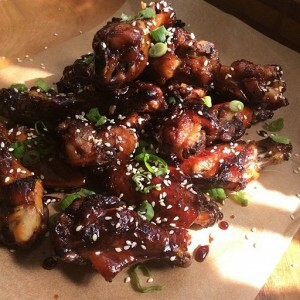 If you’re looking for the finger-lickin’-good wings or drumsticks, this is the recipe to use! It’s flavorful and easy, using minimal ingredients. Enjoy! Makes 12-16 pieces. 2 TBL honey, such as Wild Mountain or Orange from our Honey Hole Honey Co.
Cut the wings into thirds, cutting between the bones, or use whole drumsticks. Discard the wing tip portion or save for stock. In a large bowl, toss the chicken with flour; season with salt and pepper. In a small bowl, mix together the honey, garlic, paprika and Tabasco. Stir in the BBQ sauce. Taste and adjust seasoning as needed. Separate about 1/3 of the sauce into a separate bowl, set aside. Place the chicken on a foil-lined, rimmed baking sheet and brush with some of the honey BBQ mixture. Broil chicken about 3 inches below the heat element for 8 minutes. Turn the chicken and brush again with the honey BBQ mixture. Broil an additional 4 minutes or until cooked through. Discard the bowl of sauce used to brush the wings. Brush the cooked wings with the reserved honey BBQ sauce or serve on the side. This recipe, from Luisa Ormonde Hancock of Luisa’s Catering in San Carlos, is absolutely amazing. Marinating overnight gets the flavor deep into the drumsticks. You’ll love them! The recipe is easy to double, if needed. 1 TBL honey, such as our Honey Hole Honey Co.
For the Marinade: Combine all marinade ingredients in a large bowl. Add chicken and toss to coat. Keep in bowl and cover with plastic wrap or transfer to large zip-top freezer bag, squeeze out the air and seal. Refrigerate 8 hours or overnight. 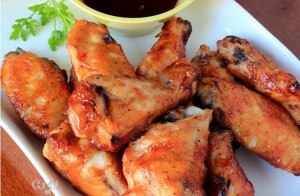 Preheat oven to 375 degrees F. Remove chicken from marinade and shake off excess sauce. Place chicken pieces on lined baking sheet (parchment or lightly greased foil). Bake 20 minutes, flip and bake 15-20 more minutes to crisp the skin. Meanwhile, make the Balsamic Teriyaki Glaze as the wings bake. For the Balsamic Teriyaki Glaze: Combine soy sauce, balsamic, brown sugar and honey in a small saucepan. Gently boil, stirring occasionally, for 3 minutes, until it gets syrupy. Watch carefully, so it does not boil over or get too thick. Remove from heat, stir in garlic and ginger. To Serve: Place baked chicken in large bowl, pour just enough glaze over to lightly coat and toss. Transfer to serving platter and garnish with green onions and toasted sesame seeds. *Note: Use a dry saucepan or frying pan to toast the sesame seeds, stirring constantly over medium heat until golden. Any extra Balsamic Teriyaki Glaze may also be used as a finishing glaze for baked salmon, chicken or shrimp. When cooked this simply, chicken wings lend themselves to a variety of uses…mainly dipping and finger licking, of course. Serve with either your favorite wing go-to sauce or choose from one we’ve listed below. Makes 12-16 pieces. Cut the wings into thirds, cutting between the bones. Discard the wing tips or save for stock. In a large bowl, toss the wings with olive oil. Sprinkle on the flour, salt and pepper, then toss to coat again. 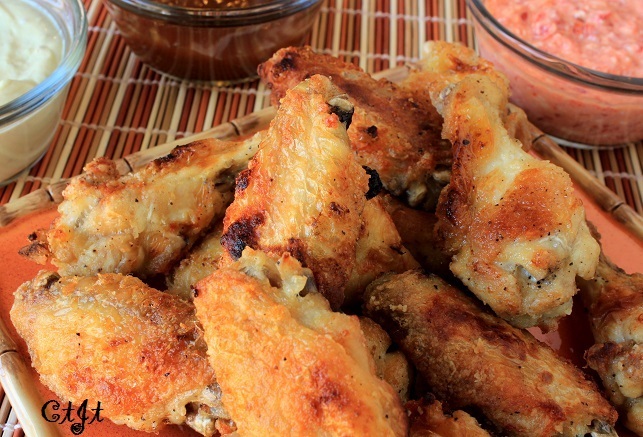 Place the wings on a foil-lined, rimmed baking sheet. Broil them about 6 inches below the heat element for 12-16 minutes. Turn the wings over and then return to the oven to broil for 8 minutes more or until cooked through, crisp and nicely browned. Serve as is or with a dipping sauce of choice. You can either serve this as a dip or spread a bit over each cooked wing – it’s delicious no matter which you choose. Serves about 4-6. Directions: In a small bowl, blend together all ingredients. 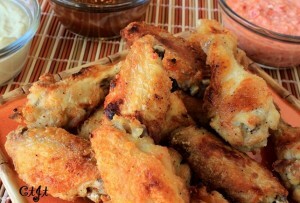 Serve at room temperature with cooked wings as either a dip or a spread. Serve this either as a dip for cooked wings or brush it over the wings before they’re popped under the broiler to cook. So good! Serves about 6. Directions: In a small saucepan, combine brown sugar and flour. Over medium, medium-high heat, add water, balsamic, soy sauce and ketchup. Heat and stir on medium until boiling and thickened (it’s a quick process). Remove from heat. Serve warm or at room temperature. You can either serve this sauce as a dip or brush it over cooked wings – it’s delicious no matter which you choose. Adapted from Barefoot Contessa Family Style. Serves about 4-6. Directions: Whisk together the ingredients in a small bowl and serve chilled or at room temperature with prepared wings as either a dip or a spread. Delicious served with spicy chicken wings. Adapted from Barefoot Contessa Family Style. Serves about 6. Directions: In a food processor, blend together the cheese, yogurt, milk, Worcestershire, salt and pepper until smooth. Serve with the wings.